There’s a saying that all knitting is made up of just two knitting stitches: the knit stitch and the purl stitch. That’s true … sort of. We’ve gathered several stitch patterns from favorite designers here for you. These were originally published in Interweave Knits Holiday Gifts 2011, and we presented them as gifts to you, our lovely readers. We love these stitch patterns, and wanted to make them available to everyone. You can use them on scarves, shawls, dishcloths, mittens, and wherever else you need a beautiful stitch pattern. These stitches can be combined to make all kinds of different designs, from easy knit and purl stitch patterns to the most complicated lace stitches. I’ve gathered some of my favorite stitch patterns here for you in our new free eBook, Guide to Knitting Stitches! 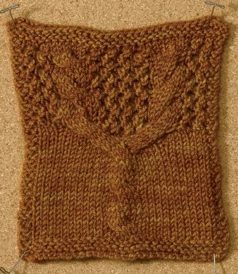 A gentle cable flows through the stockinette portion and opens out into a branching lacy stitch. 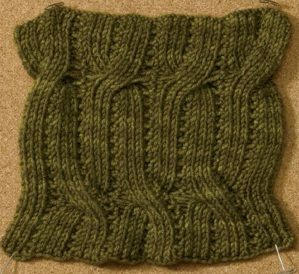 Try using this pattern at the neckline of a sweater or cuff of a sock. Inventing cable motifs is so much fun! Unusual crosses, increases, and decreases make for an engaging pattern with big graphic impact. A background of 1×1 rib makes this two-sided pattern doubly attractive—flip it over and it looks the same. Reversibility makes it ideal for scarves and cowls. 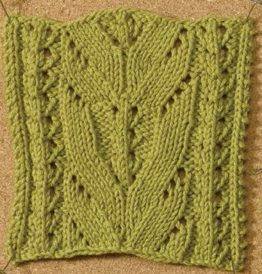 This pattern follows all the rules of traditional colorwork: short floats, no more than two colors per row, symmetrical repeats. Because the repeat is only eight stitches wide, it is well suited to small projects such as hats, mittens, and socks. A wide, 17-stitch panel is set between narrower lace columns in this handsome stitch. It would look delightful running up the back of a knee-high stocking! This pattern started as a modification of a cat’s paw motif, and this one that was almost unrecognizable from the original inspiration. 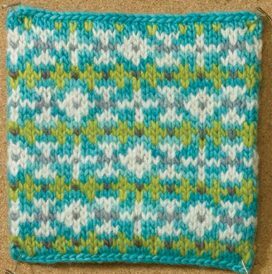 This colorwork pattern was inspired by the motifs from the 1930s, highlighted in Michael Pearson’s Traditional Knitting. Kate swatched over ten permutations—changing a stitch here, repeat there, placement of color somewhere else—which led her to this final design. 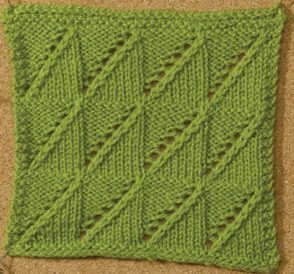 Melissa was tinkering with ways to create clean diagonal lines with knits and purls. She decided yarnovers and decreases would add another layer of visual interest. She’s used versions of this pattern in two of her published designs. 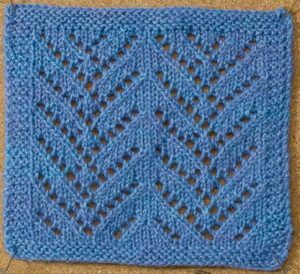 Chrissy designed this pattern for use with variegated sock yarn. Nupps give visual interest without the bumpiness of a bobble. Learn the different knitting stitches out there to take your knitting stitches to the next level! 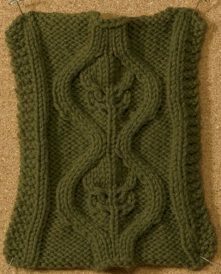 Do knitting stitches intrigue you? 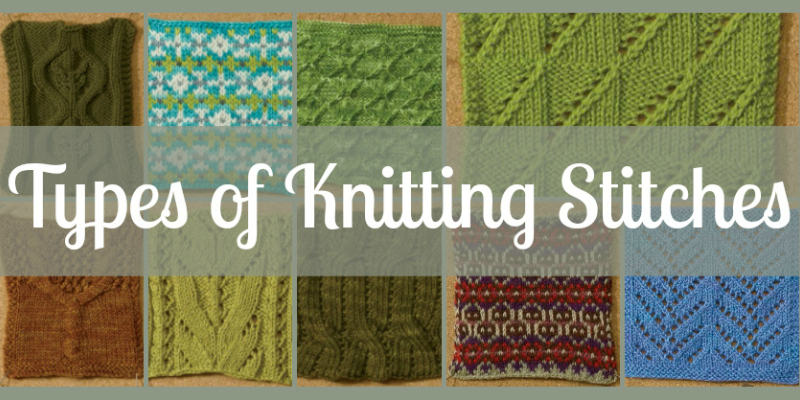 Have you wanted to try new knitting stitches patterns, but didn’t know where to begin? Then this is the free eBook that you’ve been waiting for! 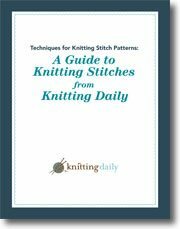 The experts at Interweave put together this collection of knitting stitches, just for you. Now you have your very own knitting stitch library! 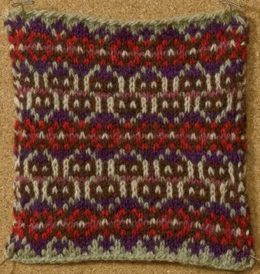 You’ll find knitting stitches for beginners as well as more involved stitches to keep you challenged. 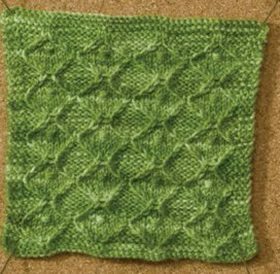 This guide to types of knitting stitches has all of the instructions that you’ll need to knit all nine stitches! Grab your free copy today.